Stitch your way into the great outdoors with an embroidery pattern that will bring out the adventurer in you! Whether you love mountains, valleys, camping or stargazing, you'll find a pattern that will inspire you to get off the couch and get into some outdoor embroidery. With a quote from John Muir, this hand embroidery pattern from The Kitschy Stitcher features a collection of peaks reaching into the clouds. 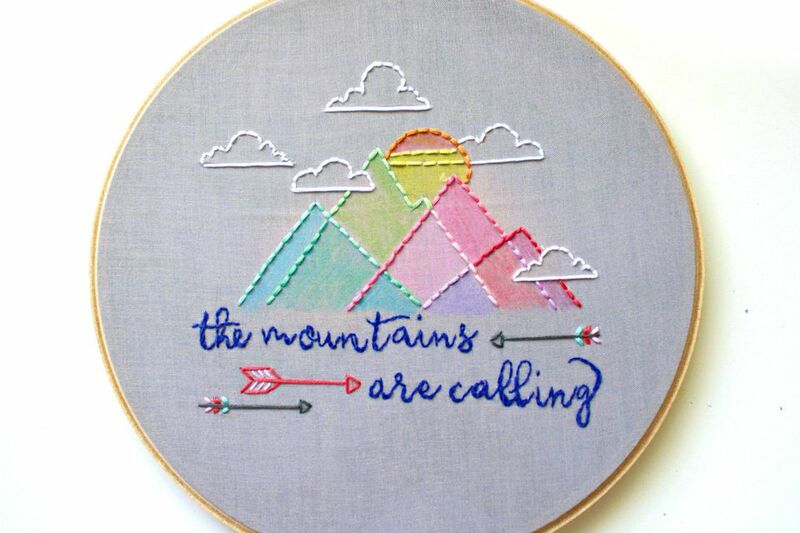 By using color tinting and a unique mix of thread colors, the mountainscape takes on a transparent look. The pattern itself is simple enough for those who are new to embroidery, but there's plenty of room for more experienced stitchers to add their own bits of extra flair with more complicated stitches or fill stitching. If you're headed outdoors for an adventure, you'll surely need to take a few essentials along, and Brit + Co shows 3 ways to embroider a travel pouch. One of the free patterns has a short phrase and a nod to a compass, while another has triangles that look like tiny colorful mountains. After stitching one of these, you'll even be ready to take some embroidery along on your next trek through nature. This tranquil pattern from designer Anna Kokorina looks like the perfect place to get away. With a tiny cabin nestled in the woods, it shows a bit of the cozy along with the great outdoors. And the Foggy Forest is just one of outdoors patterns in this Etsy shop. You'll also find themes of camping, mountains and more. Are you ready to get lost in the great wide somewhere? This delightful pattern from Cozy Blue will encourage you to do just that. The embroidered lettering leads you off the main road and into the mountains, and the pattern includes some larger than life foliage with a really fun style. You might be sitting in your backyard, taking a walk through the woods or foraging for fungi, but at some point, you'll find some mushrooms while you're outdoors. Why not stitch those mushrooms in the form of a mandala? This free pattern would look fantastic as redwork or in a collection of neutral shades. If you're not up for stitching the entire design, you can also choose just a few of the fungi to work on their own or in a grouping. This wonderfully stylized pattern from Lova Revolutionary has so many elements associated with the outdoors: trees, mountains, stars, camping and even a bear paw print. With that fancy tent and the dancing pine trees, it almost looks like a little party in the forest! Head to the forest and embroider some fun! One of the great things about being outdoors at night is the sky, which is what this embroidered scarf project is all about. Katie Shelton from A Beautiful Mess shows you how to use constellations as patterns to create your own wearable night sky. Although the DIY suggests stamping the stars and stitching the lines between them, you could easily embroider the stars with star stitch. Ain't no mountain high, ain't no valley low, ain't no stitching wide enough. This pre-printed embroidery kit from Oh Sew Bootiful is ready to stitch! Or, if you want your mountainscape to be a little more DIY, check out the PDF version of the pattern. Bring some of the outdoors in with this faux bois (which means false wood) embroidery. Designed to resemble initials carved into a tree, Laura Howard's wall hanging is charming and romantic without harming nature. Of course, you can customize the "carving" or use this as inspiration for something other than wall art. Try making a faux bois pillow or a table runner.